People seldom talk about their sleeping habits except when it is has become too much for them to deal with anymore. That’s when they go see a doctor to help them sort things out and feel normal again. Unfortunately, not everything can be solved with just a prescription. Other times, far more effort is required; starting from the assessment before appropriate interventions can be advised. Sleep disorders are among those things you often keep to yourself and only discuss with your attending physician. Aside from being embarrassing, others don’t usually talk about it too so you feel weird exposing your deepest, darkest secrets out in the open. You don’t have to wander around in search of the best people to help you manage your sleep conditions anymore. Sleep may have been elusive for a while but you’ll be able to get a good night’s sleep once more if you get yourself checked in at a reputable sleep clinic to get to the root of your problem. No need to self-medicate or try a long list of remedies that are said to promote restful sleep like drinking warm milk, listening to relaxing music, or even counting sheep because what you need all along is medical help. So, why visit a sleep clinic? These are specialty hospitals or clinics that focus mainly on sleep-related disorders and issues where patients often have to stay for the night to be assessed properly since symptoms don’t usually manifest during waking hours. When someone is suspected of suffering from sleep apnea, they’re often sent for a sleep study (also known as polysomnography). This involves their spending the night sleeping at a clinic, with numerous electrodes hard-wired to their head. There are diagnostic devices that they can use at home, although these can also be rather cumbersome. By contrast, the new SomnaPatch is quite simple and – according to the recently-released results of a study – almost as accurate as polysomnography. Made by Mountain View, California-based startup Somnarus, the SomnaPatch weighs less than an ounce, and consists of a forehead-worn disposable adhesive patch connected to a nosepiece. Worn while the patient sleeps in their own bed, it uses integrated sensors to measure and record factors such as nasal pressure, blood oxygen saturation, heart rate, respiratory effort, sleep duration and changes in body position. These sleep clinics often conduct the same tests but at times may use innovative technologies that are not yet offered in other mainstream clinics. 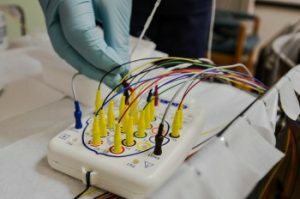 A night spent in a sleep clinic will show the doctors what really happens to your body during your sleep since you are connected with leads that assess your heart rate, eye movements, brain activity, snoring, and other body movements to give them an idea what’s going on in your body during your slumber. Doctor Irshaad Ebrahim of the Dubai-based London Sleep Centre describes the number of current sleep disorders as “an epidemic”. The number of sleep clinics in the UAE are on the rise, as are do-it-yourself responses such as sleep treatments at luxury hotels and online apps for managing one’s sleep cycle. “It is a response to demand,” says Ebrahim, “just the number of people seeking help”. According to Elizabeth Graf, a clinical psychologist at a private clinic in New York, “research continues to show the emotional and physical benefits of sleep”. Studies have linked lack of sleep to poor performance at work, depression and overall health, including links to cancer. It is not uncommon for studies to speak about the “public health crisis” of lack of sleep, in which billions of dirhams are spent tackling the secondary effects of poor slumber. Others point to its effect on the economy, and even its role in disasters such as the nuclear meltdowns at Three Mile Island and Chernobyl. Sleep clinics are helpful in diagnosing sleep disorders because they are equipped with the current technologies used in visualizing and understanding brain activity and everything else that matters in your sleep to find out what could have possibly gone wrong and what can be done about it. However, there are instances when sleep clinics aren’t immediately able to determine your sleep problem. Then, a sleep study may be your next option. More often than not, sleep apnea is the cause of your misery. If CPAP isn’t something up your alley, you can check with your doctor whether an anti-snoring mouthpiece may work for you. It may not be as effective as CPAP but it’s the next best thing than nothing at all. You can opt for a mouthpiece like this one: https://snoringmouthpiecereview.org/zquiet or a similar device like: https://snoringmouthpiecereview.org/good-morning-snore-solution. Don’t put off going to a sleep clinic… no matter how inconvenient it may initially seem, it is much better than continuously losing sleep from sleep apnea like you do now. Sleeping is more of a luxury for many folks these days. It is rare for people to get that needed eight hours of sleep daily. Most of the time, it is normal for a person to lack sleep, especially if they have a deadline to catch or they are busy with a certain event that they lose track of time because of all the preparations. However, people rarely get themselves checked or treated for lacking sleep. I mean, you just have to deal with it and get on with your life even if you didn’t sleep well the night before. It is something you don’t talk openly to other people. However, a lot has changed over the years. People are more open now in discussing the various health issues they have to deal with in secret like their sleeping habits. The number of sleep clinics these days is a testament to how people take their sleep seriously today. Numerous studies show that your health deteriorates with chronic sleep deprivation. People are increasingly becoming more health conscious that our modern sedentary lifestyle is quickly catching up to us. If you truly suffer in your sleep, you can confirm it after undergoing sleep tests in reputable sleep clinics. Not too long ago, sleep was barely on the radar of concerns for the vast majority of businesses, neither in regards to employee wellness nor as a way to reach consumers. Typically, the issue of sleep was treated as an afterthought or inconvenience. And while bragging about perpetual sleep deprivation and burning the candle at both ends is still a commonplace for many, in the past few years, perspectives have started to shift. A growing body of research and increased public awareness of sleep has led this trend. In turn, the new awareness of sleep has awakened industries both old and new on several fronts. In the past decade, science has made significant headway into understanding sleep. While it may seem like a basic function, shuteye is actually quite complex and interconnected with several other aspects of mental and physical health. Some people actually feel uncomfortable at first at the thought of spending the night in a sleep clinic that is so sterile you feel overly conscious. Then, you’d be strapped all over with leads and a stranger is watching your every move all throughout your stay. Mind you that the real action actually happens once you sleep. But as uncomfortable it may seem, a stay at a sleep clinic can do you more good than whatever it is you are worried about especially if you really are suffering from an undiagnosed sleep disorder. Lisa: Would you talk about the risks of not treating sleep apnea? Dr. Gosman: Not treating sleep apnea can cause long term health issues, including high blood pressure, strokes and heart attacks. It can also limit a person’s abilities to perform duties at work, operate a car or heavy machinery safely. Lisa: Debbie, can you tell us about a sleep study, what it is and what it will tell you? Debbie: Patients watch a short video so they know what to expect and have an opportunity to ask any questions. Then the patient settles into one of the center’s hotel-like rooms. During the study, we measure their oxygen and monitor their heart rate. Generally, once the patient lies down and realizes that they can sleep on their side if that’s more comfortable, most patients do well. Two types of people get tested in sleep clinics. First, the ones who volunteer to get tested oh so desperately. Second, there are the ones who are still in denial of their condition and quite clueless of what to expect. In particular, patients with sleep apnea are afraid of the unknown. Many of them don’t know what happens during sleep tests. They think it might be painful especially that electronic leads will be attached to them. They’re also conscious about how to act when someone is watching their every move. They’re even conscious if others can tell what they are dreaming about. Some find it hard to drift off the sleep but despite these initial worries, they still manage to sleep and get tested after all. More often than not, the culprit is sleep apnea. It is a deadly sleep disorder that causes breathing pauses in your sleep and may lead to sudden death if not treated right away. Better get it over with and get on the waiting list of the nearest sleep clinic now than suffer in silence in your sleep, or better yet, the lack of it. You’d likely get prescribed to have CPAP or a similar snoring mouthpiece or gadget that can address any physical aberration and prevent those deadly breathing pauses during your sleep. Try https://snoringmouthpiecereview.org/zquiet or https://snoringmouthpiecereview.org/snorerx. Both are convenient to use and works great. You can now sleep soundly at night without worrying if you’d still be able to wake up the next day. Snoring is a constant drag and a distraction at night especially for couples. Imagine being woken up from your deep slumber by a snoring spouse or partner – so irritating, right? However, as annoying as losing some well-deserved rest, snoring is also a cause of concern as sleep apnea is the likely reason for that annoying sleeping sound. To find out if you suffer from sleep apnea, a visit to a sleep clinic and undergoing some sleeping tests can help you a lot. A doctor who specializes in the field of sleep management can help you determine if your snoring is indeed because of sleep apnea and which snoring device best suits your case. Sleep clinics can likewise help you make important lifestyle changes so that insomnia and sleep apnea will just be distant nightmares of the past. The sleep testing services market is expected to be valued at US$ 8,395.7 Mn by the end of 2021, reflecting a CAGR of 12.9% during the forecast period (2016–2021). Full polysomnography sleep testing has strong penetration in in-lab sleep testing services owing to the reliable outcome and diversified scope in terms of disease diagnosis. Moreover, the ready availability of reimbursement and higher awareness level of PSG tests positively impacted the growth of full polysomnography testing segment in 2015. Reimbursement policies are playing a vital role in sleep disease diagnosis, and are also responsible for the commercial success of home-based sleep testing solutions. Preference in the leading market of North America is shifting from laboratory-based sleep testing services to home sleep testing services owing to lower cost and easy availability of services. An increasing number of individuals diagnosed with sleep disorders is expected to promote the use services. In-lab sleep testing services sub-segment accounted for 69% share of the diagnostic sleep testing services segment share in 2015. However, the segment is expected to witness the reduction in terms of market growth owing to increase in adoption of cost-effective and less time-consuming home sleep testing services over the forecast period. On the basis of service type, the sleep testing services market is segmented into diagnostic services and treatment monitoring. Diagnostic sleep testing services are segmented into in-lab sleep testing and home sleep testing. In-lab sleep testing services segment is further sub-segmented into electroencephalogram, full polysomnography, CPAP/BiPAP Titration, multiple Sleep Latency Test (MSLT), and maintenance of wakefulness test (MWT). 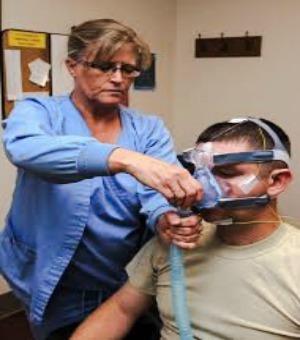 Full polysomnography test sub-segment is expected to witness highest growth potential during the forecast period. High revenue from this sub-segment is attributed to high cost of full PSG sleep testing. However, the in-lab sleep testing sub-segment is anticipated to witness a significant growth in terms of revenue, owing to transition to home sleep testing services. The growth of these sleep clinics and sleep-related services proves that many people indeed suffer from sleep disorders like insomnia and sleep apnea. However, there is a recent controversy surrounding sleep clinics and fraudulent Medicare claims involving sleep studies. The company owns 20 clinics in Northern California that treat patients with sleep disorders. According to the suit, the clinic’s owners and operators, Anooshiravan Mostowfipour, 58, and Tara Nader, 58, had billed Medicare going back to April 2002 for sleep tests by technicians who did not have the needed certification. According to the news release, the lawsuit “alleged that the defendants fraudulently billed Medicare for sleep studies conducted by unlicensed individuals in unapproved locations; improperly dispensed durable medical equipment from unapproved locations using unlicensed technicians; and paid doctors for referrals in violation of the federal Anti-Kickback Statute.” The company’s owners did not admit to or deny liability. The settlement was announced by the U.S. government on Dec. 28 and as part of the settlements, the owners are not allowed to make any Medicare claims for three years. While a sleep clinic faces a sensitive legal issue like this one, there are plenty others out there who run a legitimate operation without ripping people of their hard earned money. 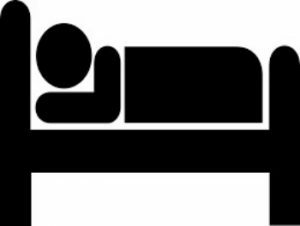 These sleep clinics support people who have sleeping issues and help them identify what sleeping disorder they have so appropriate medical interventions can be taken to promote restful sleep. Some of them even recommend certain sleep apnea products: https://snoringmouthpiecereview.org/zquiet. You should never take the issue of sleep lightly because chronic sleep deprivation predisposes an individual to a long list of health conditions that could have been avoided had they been able to sleep well at night. And the best way to age gracefully is to also get that 8-hour sleep daily, something we should all keep in mind if we want to look young and feel young always.